On January 23, 2018 an installation in documenta 14 was vandalized. On June 6, 2018, the city of Kassel dismantled that installation, an obelisk in the center of Königsplatz, or possibly relocate the site-specific work. On October 3, 2018—without the artist’s knowledge or consent—Das Fremdlinge und Flüchtlinge Monument (Monument for Strangers and Refugees), 2017 was dismantled. Seemingly isolated fragments of news such as these have circulated in the aftermath of the artwork’s removal, created by Nigerian-American artist, poet, theorist, activist, and curator, Olu Oguibe, eerily mirroring the conditions of the now dismantled work. And yet, an obelisk, by definition, stands strong, stretching to the sky, composed of a single stone, and seemingly unassailable. But from single object to many, from inscriptions to infinite resonances, from seemingly monolithic global reality to multiple experiences, the unintended performativity of Oguibe’s monument continues to teach its viewers—even in absentia, or perhaps because of it. Standing 54-feet tall, the obelisk Das Fremdlinge und Flüchtlinge Monument (Monument for Strangers and Refugees), radiated formal strength across the public circle. And yet, its gold inscription on each of its four sides proclaimed a non-magnanimous—even humble—message: “I was a stranger and you took me in,” in German, English, Arabic, and Turkish, sourced from the biblical Gospel of Matthew, 25:35. The work takes viewers on a journey through its many layers as a monument to the present and implicated future, a public installation in an exhibition, and through its fraught and performative aftermath. Audiences encountered these thick layers in person and through the news, composing its meaning from intended and perhaps unintended actions. 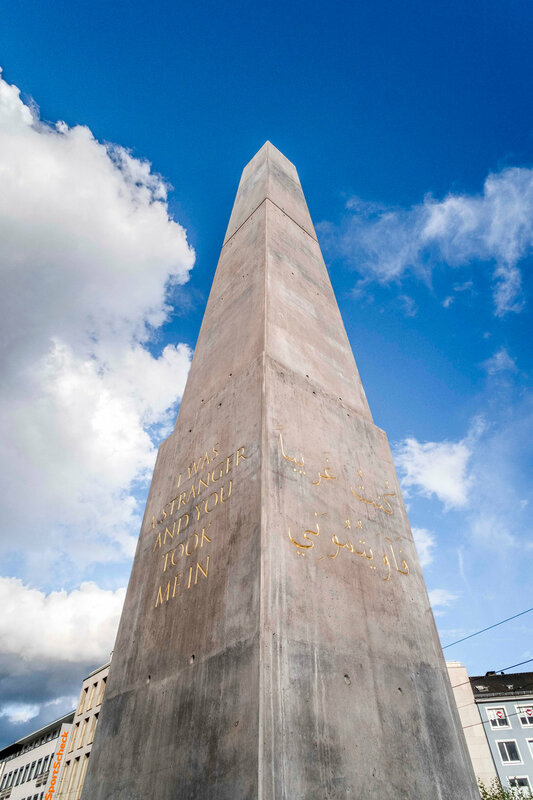 In this way, rather than a commemoration of a past historical event, the monument’s physical form moves further towards an embodiment of the present plights of migrants, refugees, and asylum seekers, and continues such an embodiment, tragically, in its displacement. Its removal, however, does not eradicate its message, but instead perpetuates its life, in keeping with the decolonial discourse of “unlearning what we know and challenging its enabling epistemic systems,” that Ugochukwu-Smooth C. Nzewi’s exhibition review of documenta 14 describes. It is the layered embodiment of Oguibe’s work, and the meaningful “unlearning” and “challenges” of its unintended performance, that I aim to examine. To begin with Oguibe’s inscription, the words speak in first-person, immediately and intimately relating the voice of the refugee and illuminating some of the artist’s connection to the passage. Conceptually, it neither contextualizes nor demands, but recalls those who, in the biblical parable, cared for the Son of Man in his time of need; and in return, they are rewarded in heaven. In the parable, these righteous curiously ask when they took in their Lord, earnestly not remembering what would most likely have been a momentous occasion; and he answers, that they did so whenever they gave to “the least of these.” As documenta curator Adam Szymczyk describes, Oguibe’s monument simply states a fact of what happened. It does not preach. At the same time, the work appropriates Jesus’ parabolic phrase—words undoubtedly heavy with responsibility, perhaps with a voice in Oguibe’s poetry “like a dagger in their ribs”—inscribing them into the body of the obelisk in the four languages most common to contemporary Kasselers. In this way, the monument speaks as the refugee in the present. But who is the refugee when the “Son of Man” is elided with the “least of these”? Are “you” and “we” interchangeable? Who learns and “unlearns” from this message? The open-endedness of the monumental words paradoxically grounds a shifting present orientation that challenges viewers to wrestle with their place in its meaning. This fluid, present-tense embedded within the monuments’ inscription prompts the consideration: with what type of knowledge do we approach history? With fluidity and movement or stasis? Once again, the obelisk is multilayered. Movement around the sculpture by Kasselers and documenta-goers, as I witnessed in person, activated an experiential manner of encountering the work, rather than an overly intellectualized acquisition. This experiential encounter on the part of viewers connects the movement and migrancy of refugees, albeit in a conceptual sense. It takes a certain priority over the oft-cited story in the media of Johann Wolfgang von Goethe (1749–1832) being refused stay in Kassel for speaking French, and even the earlier history that Oguibe cited concerning the French Huguenots who sought asylum in Kassel after the revocation of the Edict of Nantes in 1685 by Louis XIV, while simultaneously not occluding these histories. Instead, the experience of circling around the monument, reading its call, and convening at its base proved meaningful for Oguibe and Kasselers as a site and message of present reckoning. Oguibe’s work exhibited in the Athens iteration of documenta, also emphasized the importance of turning towards experiential forms of knowledge for understanding, especially in light of mass migrations to the region across the Mediterranean Sea. Biafra Time Capsule, 2017, consisting of documents, archival objects, and media, sited within the EMST–National Museum of Contemporary Art, Athens, was a memorial that was rarely covered in the media concerning Das Fremdlinge und Flüchtlinge Monument (Monument for Strangers and Refugees). And yet, the work commemorated the experiences of child refugees in the Nigerian Civil War of 1968–70, both in archival and participatory forms. Viewers entered Oguibe’s architecture, colored in the Biafran flag hues, and traversed a semi-sacred space consisting of the artist’s personal library materials of childhood memories. Recalling this work and its survivor gathering in relation to the Kassel monument serves to remind us of the present temporal position that such memory inhabits—as if preserved in a time capsule. And in activating histories through the experiential, we unlearn neat, categorical, descriptions and learn the relational. Alongside voice, and movement, the final artistic strategy that speaks to the monument’s relationship to the conditions of the refugee is its materiality of concrete and the contingency that such material intimated. While taking refuge in the historically Egyptian obelisk shape, the work migrates toward a sense of immediacy in the concrete substance that Oguibe admitted was not easily transformed into a public sculpture, slightly distancing itself from the permanence of the historicized form. It bears visual connotations with authoritarian architecture, which Oguibe countered with the reality that it wears away more easily than marble or bronze. But this knowledge of the fact that the structure could be materially dissolved with time, somewhat shapes the project as a whole. For indeed, the monument was only intended as an installation within the exhibition parameters of documenta. How to reconcile then a monument, traditionally a permanent work to stand the test of time, and a temporary installation? Oguibe’s work epitomizes the push and pull that those media represent and their broader symbolic and conceptual significance, between historical and present, singular and plural, nomadic and stationary, refugee and occupier. In this way, the work belongs to a legacy of the “counter-monument”—works created in the wake of World War II that artists such as Esther Shalev-Gerz and Jochen Gerz infamously staged throughout Germany as conceptual interrogations of the forms and rituals of memory. Many of these queries addressed site and reception that ultimately composed the works’ meanings. Oguibe’s monument too, while meticulously researched, planned, and executed, absorbs the dialectics embroiling its reception as part of its meaning. Oguibe’s monument has the ability to take on such meaning as kind of hybrid, between monument and installation, the latter of which is often a temporary object sited in a presumably “fixed, stable, closed context of a topologically well-defined ‘here and now,’” as Boris Groys has theorized it. Das Fremdlinge und Flüchtlinge Monument (Monument for Strangers and Refugees) was meant for Kassel’s context and aftermath, but was also meant to be taken down eventually. This proved somewhat difficult given the form that Oguibe erected—a monument, documenta’s desire to purchase a site-specific work, and the opposition that removing the work incited. What became especially curious is the way that its open-endedness enabled the work to bear ever-more meaning, as it somehow further embodied the contingent condition of the refugee in the contemporary media. As Kassel eventually attempted to negotiate its stay in Königsplatz, trying to balance reactions from right- and left-leaning political factions, the city moved in a bureaucratic chess game, much like current border disputes involving world powers and ulterior economic and political motives. The supposedly free movement and acceptance of works coming to documenta—the exhibition itself a postwar German attempt to re-enter international relations—were notions that were detained and forcibly removed without the artist’s knowledge. And finally, the message from Matthew that generated a plea to consider one’s neighbor was qualified by the right-wing AfD (Alternative for Deutschland party) in Nazi terms as “degenerate.” More and more, Das Fremdlinge und Flüchtlinge Monument (Monument for Strangers and Refugees) was subjected to the position of those fleeing political upheaval and should ultimately make viewers reflect in its wake, as Nzwei and Oguibe did, on the efforts of decolonization and the nature of hospitality. The artist poignantly expressed in an interview, “each one of us is bound to the stranger.” This recognition becomes a two-fold reality when one considers both the geo-political and psychoanalytic resonances for this assertion. On the one hand, we are all inextricably linked to the totalizing effects of globalization, which have driven and continue to drive mass movements of people since the industrial revolutions and surely within future technological revolutions. The stranger, on the other hand, can also easily become and already is each one of us, as we exist as both subjects to ourselves and objects to others in the world. So how to acknowledge this inner reality and its external implications for “civic health,” as Holland Cotter put it? Oguibe’s monument and even its complex aftermath leads us to dwell upon this question as Das Fremdlinge und Flüchtlinge Monument (Monument for Strangers and Refugees) is not only a call for action, but a rumination about hospitality—who gives to whom? Will there be a chance for such an exchange? See “Vandals Deface Olu Oguibe’s Documenta Monument,” Artforum, 31 July 2018: https://www.artforum.com/news/vandals-deface-olu-oguibe-s-documenta-monument-73940; Henri Neuendorf, “Bowing to Pressure From Right-Wing Politicians, the City of Kassel Will Move Olu Oguibe’s Pro-Immigration Obelisk Outside of the Town Square,” ArtNews, October 11, 2018: https://news.artnet.com/art-world/olu-oguibe-kassel-obelisk-1369624. New Heart English Bible: Gospel of Matthew, 25:35. Ugochukwu-Smooth C. Nzewi, “documenta 14: learning from Athens,” African Arts, Vol. 51, No. 4 (Winter 2018): 89–91, 90. Nate Freeman, “City of Kassel Awards Olu Oguibe Documenta 14’s Arnold Bode Prize,” ArtNews, 5 July 2017: http://www.artnews.com/2017/07/05/city-of-kassel-awards-olu-oguibe-documenta-14s-arnold-bode-prize/. Nzewi, “The Curve of Time: An Interview with Olu Oguibe,” http://www.revistaatlantica.com/en/contribution/la-parabola-del-tiempo/. Freeman, “City of Kassel Awards Olu Oguibe Documenta 14’s Arnold Bode Prize,” http://www.artnews.com/2017/07/05/city-of-kassel-awards-olu-oguibe-documenta-14s-arnold-bode-prize/. Ugochukwu-Smooth C. Nzewi, “The Curve of Time: An Interview with Olu Oguibe,” Atlántica #59, Accessed 1 March 2019: http://www.revistaatlantica.com/en/contribution/la-parabola-del-tiempo/. See Chapter 1, “Countermonument: Memory against Itself in Germany” in James E. Young, The Texture of Memory: Holocaust Memorials and Meaning (New Haven, CT and London, UK: Yale University Press, 1993) and James E. Young, At Memory’s Edge: After-Images of the Holocaust in Contemporary Art and Architecture (New Haven, CT and London, UK: Yale University Press, 2000). Olu Oguibe, “Press Statement Regarding the Königsplatz Obelisk,” DocumentaForum, May 28, 2018: https://documentaforum.de/wp-content/uploads/2018/05/Olu-Oguibe-Press-Statement.pdf. Boris Groys, “The Topology of Contemporary Art” in Antinomies of Art and Culture: Modernity, Postmodernity, Contemporaneity, edited by Okwui Enwezor, Nancy Condee, and Terry Smith (Durham, NC: Duke University Press, 2009), 74. Dorian Batycka, “Dispute Erupts Over Artist’s “Monument for Strangers and Refugees” in Germany,” Hyperallegeric, May 31, 2018, https://hyperallergic.com/445282/olu-oguibe-monument-for-strangers-and-refugees-dispute-kassel-documenta/. As of October 12, 2018, the city is currently in discussion with the artist about the future location of the work, which will most likely be Treppenstrasse according to “Artist agrees to move Documenta monument honoring refugees, following pressure from German far-right,” Artsy, October 12, 2018: https://www.artsy.net/news/artsy-editorial-artist-agrees-move-documenta-monument-honoring-refugees-pressure-german-far-right. Holland Cotter, “Art, Democracy, and Justice: Holland Cotter @ The Frist Art Museum,” Audrey Molloy, trans. ArtIndex, Accessed 7 March 2019: https://www.theartindex.org/artindex/2018/11/28/art-democracy-and-justice-holland-cotter-lecture-the-frist-art-museum. Laurel McLaughlin is a PhD candidate in the History of Art at Bryn Mawr College and the Brunilde Sismondo Ridgway Curatorial Fellow at the Institute of Contemporary Art, Philadelphia. Her dissertation research traces migratory identity formation in feminist ritual performance situated in the United States and its strategies of dispersal in various forms of documentation from the 1970s to 2016. She has presented her research at the University of Pittsburgh, the University of Pennsylvania, the University of California, Berkeley, and the College Art Association, New York, among others. Additionally, she has held research and curatorial assistant positions at the Philadelphia Museum of Art, Slought Foundation, and the Pennsylvania Academy of the Fine Arts.